I have a beautiful vase in my possession. It is a beauty, even it might be a fake. I think the material is faience and not porcelain. From the insight there is no glaze but a circular pattern of clay. 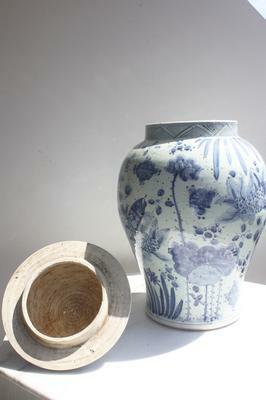 The hight of the vase is 67 cm (approx 26 Inch high) and the vase has a waistline of 120 cm (47 Inches); a really a big boy. I have no idea what it is, and because you are an expert, you might help me toward the right direction. The vase is beautiful hand painted with fish and lotus. 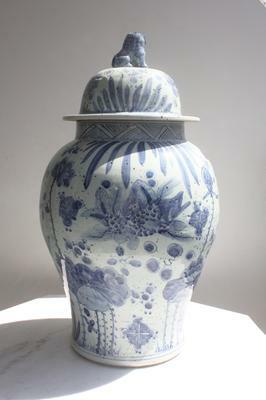 This is called a temple jar, probably because of the shape of its lid. The pictures are insufficient, showing not enough details of the decoration, and there is not bottom image. The lighting is not ideal either. But from the hue of the blue pigments it is more likely that it is 20th century.